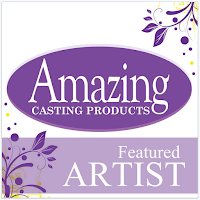 Hi Amazing Crafters! 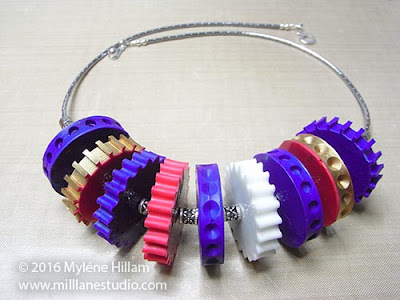 For today’s special project, I’ve designed a bright and fun necklace with an avant-garde feel. This bold, colorful piece puts an entirely different spin on steampunk. 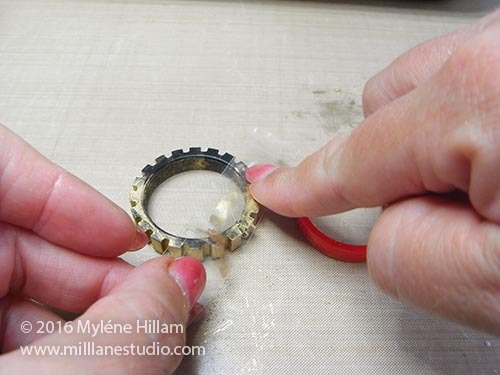 I chose Amazing Casting Resin for this project because it will cure quickly so you’ll be able to cast the necklace and put it together in an afternoon – you’ve got to love a project that looks great but comes together quickly! 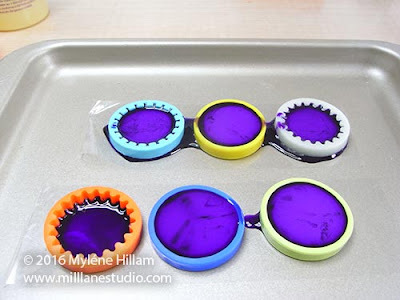 The moulds I’m using are actually silicone beer bottle markers that I found at my local kitchenware shop. 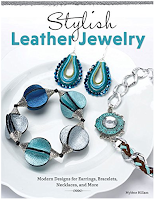 If you can’t find them locally, shop for them on Amazon. markers with Alumilite Gold Metallic powder. on the bottom surface of the powdered bottle markers. Turn all the rings outside-in. Cut a piece of packing tape and position the bottle markers on it. Press them down on to the tape. 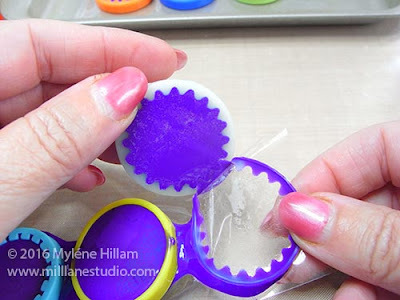 You won’t be able to burnish them because the silicone doesn’t stick very well to the tape but try to make sure they have good contact with it to minimize leakage. 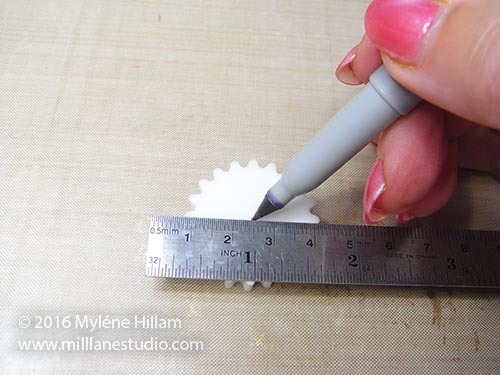 Measure out ½ oz (15mls) each of Parts "A" and "B" of Amazing Casting Resin. 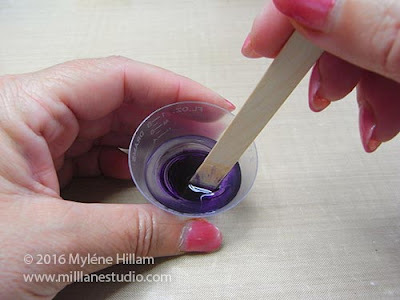 Add 2 or 3 drops of Alumilite Violet dye to Part "A". 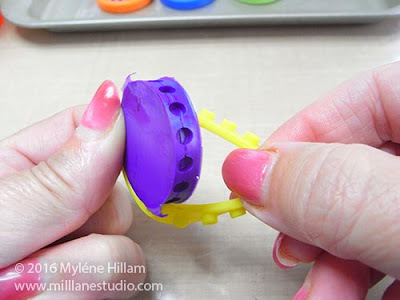 Mix the color well and then add Part "B" and mix Amazing Casting Resin according to the package instructions. CLICK HERE to view mixing/preparation. filling as many as you can with the resin. Set the cogs aside to cure. Remove the cogs from the tape. If there has been any leakage, you should be able to easily remove the flashing from the silicone by pulling it away. from the resin. It will release quite easily. 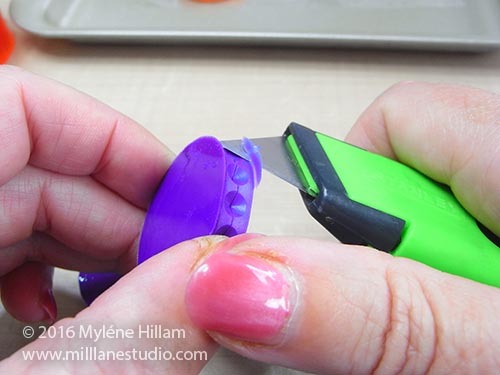 Use the Stanley knife to trim away any other resin on the top edges. Make a batch of red cogs using Amazing Casting Resin with Alumilite Red dye and a white batch with no colorant. 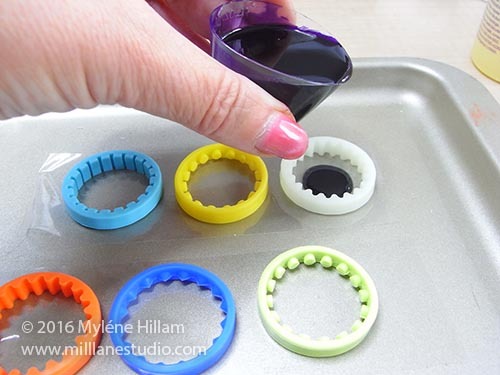 As a guide, it takes approximately 1/5 fl oz (6 mls) to fill each silicone ring. 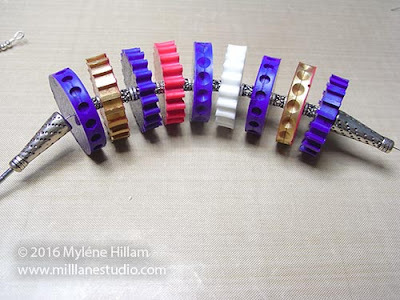 Select the cogs you’d like to use in your necklace. You’ll need nine to complete the design featured here. Measure and mark the centre of each cog. 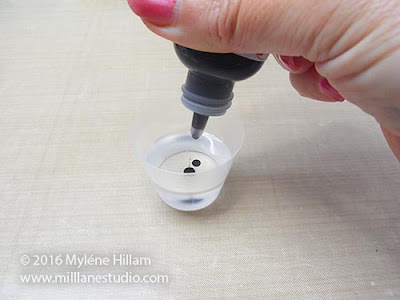 use a slow speed so that you don’t melt the resin. 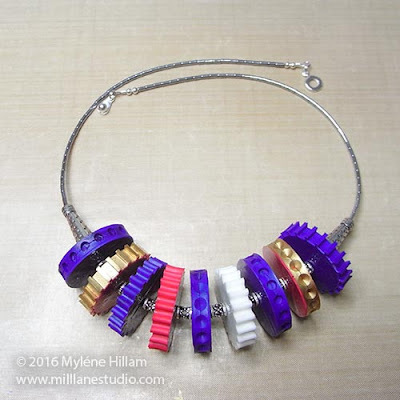 Now you’re ready to start stringing the necklace! 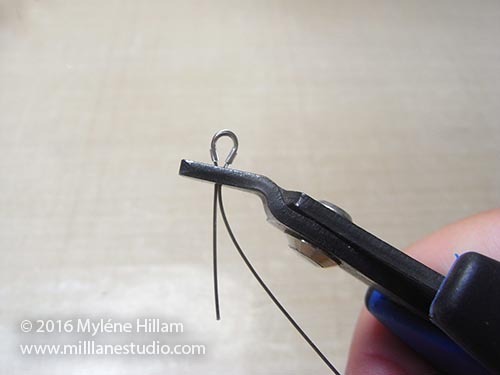 Cut a 24” (60cm) length of beading wire. 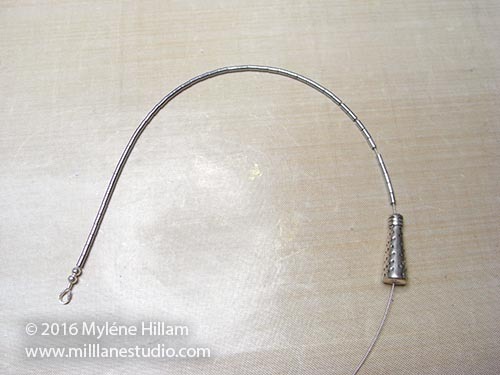 String on a crimp tube and the wire guardian. Thread the wire back through the crimp tube and then pull up the loop. Make sure the wires lay flat inside the crimp tube rather than crossing over each other. 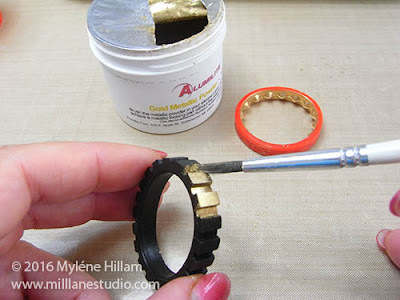 Place the crimp tube inside the second hole of the crimping tool and squeeze it gently but firmly. 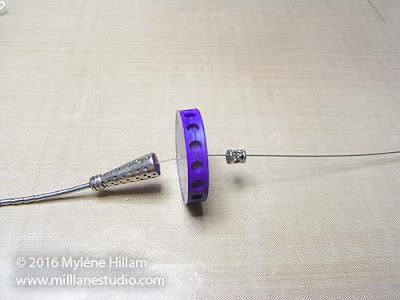 It should create two channels, one for each of the beading wires. Tug the wire to make sure it’s secure. Position the crimp tube in the hole nearest the tip of the crimping pliers and squeeze again to bring the two channels neatly to the centre. 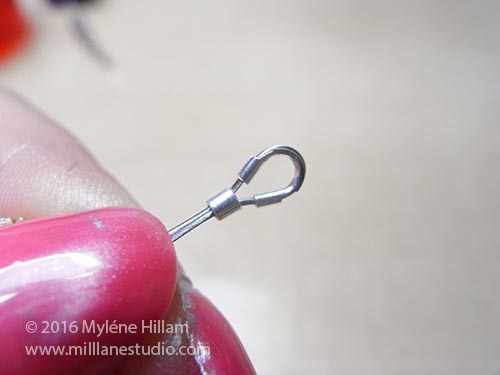 String two spacer beads on the beading wire. Draw them up to the crimp tube, making sure they pass over both wires. 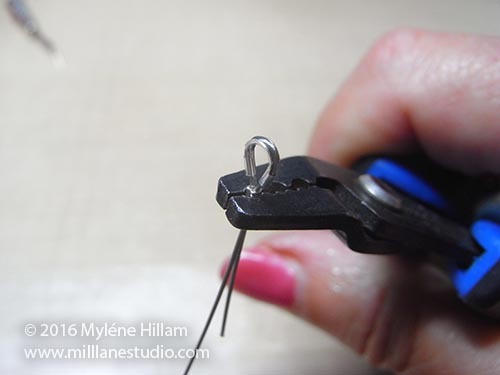 Trim the short wire as close to the second bead as you can. String 6.5” (16.5cm) of haematite beads on to the beading wire and then a cone bead. 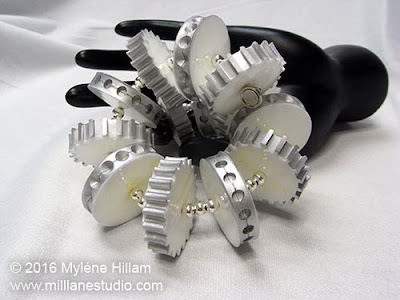 String a cog and a drum bead. Continue stringing cogs and drum beads until you have strung nine cogs and eight drum beads. String the other end of the necklace to match. Finish with a crimp and wire guardian. 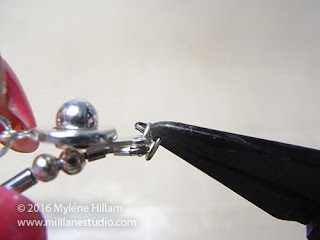 Open a split ring and connect the end of the necklace to one half of the clasp. Use the second split ring to attach the other side of the necklace to the other half of the clasp. 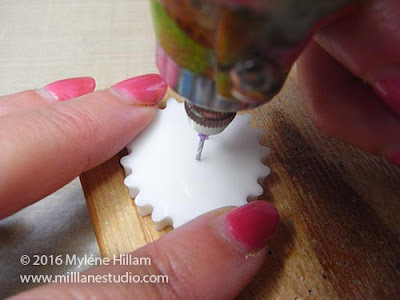 For some extra bling, glue pointy-back crystals to the holes in some cogs. 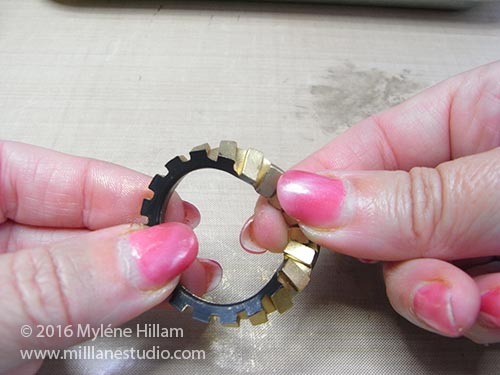 Or go for a more steampunk look, by brushing Alumilite’s Silver Metallic, Gold Metallic and Pearlescent powders on black dyed cogs. The pearlescent powder will look like pewter – adding to the industrial look. 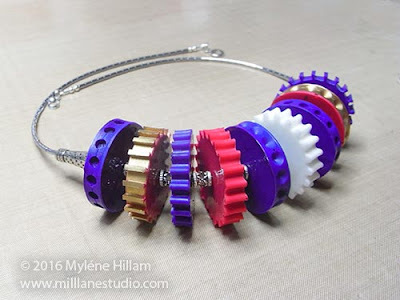 Or string the cogs on bracelet memory wire and make a really bold avante-garde piece instead. But most importantly, have fun with this idea! 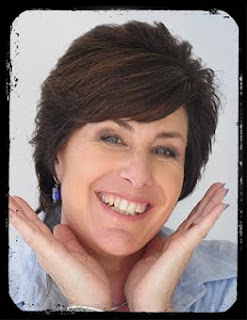 at Mill Lane Studio on Facebook for more inspiration. 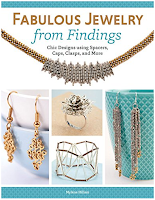 For more jewelry ideas and inspiration, please check out my jewelry-making books: "Fabulous Jewelry from Findings" and "Stylish Leather Jewelry". Thanks so much for dropping by! Check back next Friday for more from our Featured Artist Myléne Hillam... you don't want to miss it! 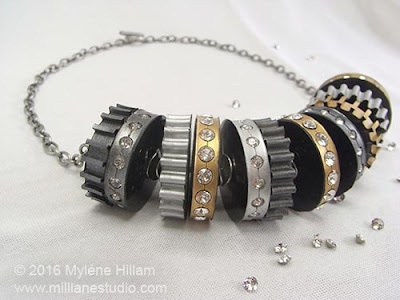 CLICK HERE to head on over to Myléne's Blog Mill Lane Studio to see more of her fabulous work! Love this idea! Great job Mylene! Thanks Tanya. I love simple ideas... sometimes they are the best!